4:1 Then was Yeshua (ישוע) led up of the 1Ruach into the 2wilderness to be 3tempted of the false accuser (devil, diabolos). 4:2 And when He had fasted 4forty days and forty nights, afterward He was hungry. 4:3 And when the tempter came to Him, he said, If you be the 5SON of Elohim (אלהים), command that these stones be made bread. 1Man shall not live by lechem alone, but by every word that proceeds out of the mouth of YHVH (יהוה). He shall give His malakhim charge over You: and in their hands they shall bear You up, lest at any time you dash your foot against a stone." 4:7 Yeshua (ישוע) said to him, It is written again, 2you shall not tempt YHVH (יהוה) Eloheinu. 4:8 Again, the false accuser (devil, diabolos), took Him up on an exceeding high mountain, and showed Him all the kingdoms of the olam Hazeh, and their glory. 4:9 And he said to Him, "All these things I will give You if You will fall down and worship me." 3You shall worship YHVH (יהוה) your Elohim (אלהים), and Him only shall you serve. 4:11 Then the false accuser (devil, diabolos) left Him, and, Hinnei, malakhim came and ministered to Him. "Repent: for the Malkut HaShamayim is at hand." 4:18 And Yeshua (ישוע), walking by the sea of Galil, saw two brethren, Shimon called Kefa, and Andrew his brother, casting a net into the sea: for they were dayagim (fishers, לדוגים). Follow Me, and I will make you dayagim (fishers, לדוגים) of men. 4:20 And they straightway left [their] nets, and followed him. 4:23 And Yeshua (ישוע) went about all Galil, teaching in their shuls, and proclaiming the good news of the Malkut, and healing all manner of sickness and all manner of disease among the people. 4:24 And his fame went throughout all Syria: and they brought to him all sick people that were taken with divers diseases and torments, and those which were possessed with false accuser (devil, diabolos), and those which were lunatics, and those that had the palsy; and he healed them. 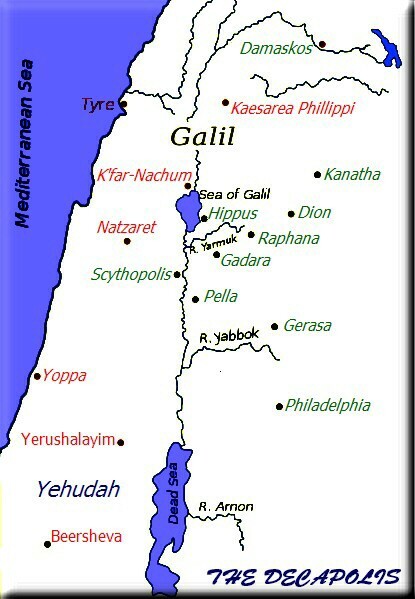 4:25 And there followed him great multitudes of people from Galil, and [from] Dekapolis (Δεκάπολις), and [from] Yerushalayim, and [from] Yehudah, and [from] beyond Yarden. Only recorded in Mattityahu and Loukas. Not recorded in Markos because the perfect Servant is immune to temptation. Not recorded in Yochanan because the pre-existent Son of Elohim cannot be tempted. Mattityahu's account of the temptation is based on the historical order. Each temptation by adversary is recorded chronologically. This is evidenced by the words "then" and "again" in Matt 4:1,5,8,10,11. Notice that in Loukas's account, the order of the second and third temptations has been reversed. This is because Loukas took a moral perspective of the temptation that is parallel to what is described in Beresheet 3:6 and 1 Yochanan 2:16. Believers, you do well to note that all temptations you face come in the above form. And the very Hashem of peace sanctify you wholly; and I pray HaShem your whole spirit and soul and body be preserved blameless unto the coming of our Master Yeshua HaMashiach.